After a strong upside move after more Euro news, the financials ($XLF) rallied hard up to resistance at $13/share. This is the level to watch going forward, and could be shortable for the next 2 days. One trade to consider here is to get long $FAZ, but we can go one step further and trade it using options. Trading options expiration has a lot of dark magic behind it, so make sure your risk is defined. Specifically, I would look to sell the $FAZ Oct 47 Put for 1.10 or higher. As long as FAZ stays above 47-- and conversely if $XLF stays under 13, this trade will make money. 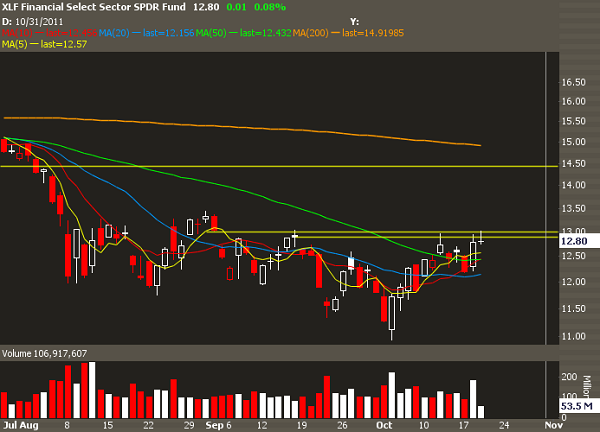 I'd would stop out if $XLF cleared 13.